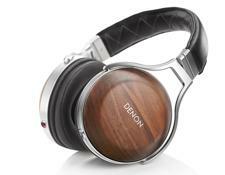 Denon has announced a new flagship over-the-ear headphone. The AH-D7200, scheduled to ship in January for $999, features 50mm FreeEdge driver diaphragms made from a nano-fiber material, walnut wood earcups, Japanese-developed soft synthetic leather for the ear cushions, real sheepskin leather for the headband, and a 7N oxygen-free copper cable. More details are available in the press release below or on Denon's website. Denon announces a new flagship over-ear headphone model designed for the most demanding audiophile. With over half a century of experience in the design and development of headphones, the new AH-D7200 reference model combines innovative technologies and carefully selected materials for the finest in private listening. It is expected to be available in January 2017 for $999. With more than 50 years of headphone manufacturing expertise, Denon designed the new AH-D7200 reference model for discerning audiophiles. It offers a unique combination of design expertise and innovative technology and engineering. Two criteria were foremost for the Denon engineers in developing this flagship model: uncompromised sound quality and unparalleled comfort. This meant the development of new designs and new materials, bringing the very best to the project to deliver exceptional performance. Behind the classic looks of the AH-D7200, almost every element is new--from the unique FreeEdge nano-fiber drive units to the shaping of the real walnut housings. Even the ear-cushions differ from established design thinking, using Japanese-developed soft synthetic leather covers chosen because they offer greater levels of comfort. At the heart of the AH-D7200 is the 50mm FreeEdge driver diaphragm, made from a nano-fiber material chosen for its rigidity and low mass. This delivers an accurate pistonic motion without distortion, and is also self-damping to cancel out unwanted resonances within the diaphragm. It's mounted in a soft, compliant surround, making it easier for it to move in response to the music signal without flexing or distorting, for the purest possible sound. The 'motor' driving this diaphragm uses CCAW (copper coated aluminium wire) to keep the voice-coil as light as possible, plus extremely strong (more than 1 Tesla) neodymium magnets to increase the linearity and the speed of response. All of this means the total energy of the driver system is directed into delivering music to the listener's ears, thanks to this unique design developed by Denon's headphone engineers, and made possible by advanced Japanese-made materials. The driver is only part of a headphone's audio system. The AH-D7200 drive-units are mounted on vibration-reducing engineering resin baffles, again reducing distortion. These are fitted into housings made from natural walnut, the dense wood being self-damping and shaped to reduce internal resonances and reflections. In addition, the use of walnut gives the headphones a warmer, more 'speaker-like' sound. Connecting these drive units to the amplifier powering the headphones is an ultra-high-quality 7N (99.99999% pure) oxygen-free copper cable, made in Japan to Denon's specification, for the best possible signal transmission. It's terminated with a durable machine-cut metal plug with a copper trim-ring. 7N copper is also used for the internal wiring of the headphones. A 'floating jack' design is used for the connections between the cable and the headphone earcups. This prevents the transmission of mechanical noise from the cable to the ears, while the detachable design means the user can experiment with aftermarket cables if required. As well as being tuned for the best possible sound, the AH-D7200 has also been designed for extreme comfort. The earcups are suspended on ergonomically curved diecast aluminium hangers, while the headband is finished in real sheepskin leather. Within the ear-cushions, trimmed with artificial leather chosen for its supreme softness and durability, memory foam allows the best fit to the user's ears. It's all part of a design engineered for maximum enjoyment over long listening sessions, from the light weight (385g excluding cable) to a fit and side-pressure optimized for the widest possible range of head sizes and shapes. Ultimate sound, unmatched comfort--the AH-D7200 is the reference design from Denon's headphone experts, for those who take their listening very seriously. • Denon Adds Three New In-Ear Monitors to Headphone Line at HomeTheaterReview.com.